Nikon has rolled out a world's first this week, with the Nikon S8000 touted as the thinnest-ever camera to come to market with a 10x optical zoom. With just 27.3mm thickness, the S800 is part of Nikon's ever-growing Coolpix range and is a camera which seems to pack a whole load of functionality into its diminutive frame. Not only is there a 14.2MP sensor on board, but users can flit between taking stills and HD movies. In this case the HD is 720p (at 30fps), not Full HD but a worthy add-on. To utilise the 10x optical zoom there's a Macro mode for close-up shots (up to 1cm) and the lens is also wide angle so the more expansive landscape images can be taken with the S800 as well. Flip the camera over and you have a high-res LCD display. It won't have anywhere near the viewing angle of OLED but at least you will be able to use it when the sun is shining bright. Other features include: Vibration Reduction on the lens, Best Shot Selector and Motion Detection. 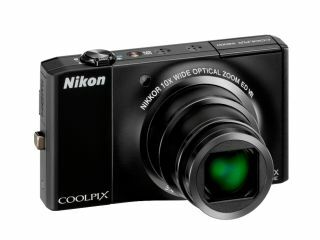 The Nikon Coolpix S800, comes in Black, Brown and Champagne Silver, and has a UK release date of mid-February, with UK pricing set at £249.99. Go to www.nikon.co.uk for more details.